I first read this book when it came out in hardback a few years back and parts of it still stick in my mind. The author offers an interesting and truely sad account of the fate of the survivors from the USS Juneau. I have never forgotten the account of the five Sullivan brothers and the other men left to die in the sea around Guadalcanal. This is a terrible story which really reminds you that war is a horrible business. The author tells a great story and you will find it hard to put the book down once you start. Wow...??? It has took me many years to pick this book up and read. I've just turned 30, and just now learning about the Juneau. My Great Grandfather, Gattis, Marvin Lee (GM3c) went down with USS JUNEAU. I blame Casey for this book. She wanted to read a book on the sinking of the Indianapolis and I saw this book on a very similar story, so I grabbed it for myself. The Juneau was sunk at the end of 1942 and due to gross incompetence, the survivors were left in the water for a week. Out of a crew of 700, 140 made it in the water, but only 10 survived. In comparison, over 300 survived the sinking of the Indianapolis. The author does a good job of describing the sheer terror of the survivors as day by day their numbers dwindle and they come under constant shark attack. But he struggles on several key areas. First, it is clear he is not a naval historian. Multiple times, he references a Japanese admiral killed in an earlier battle, but gets the battle wrong. At another point, he describes the Juneau as crippling two Japanese carriers. That again did not happen. The other main problem I had was that this book was much more historic fiction. He creates scenes time and time again with characters who died. He also projects his conceptions of why a person acted as they did. It would be a decent read for someone interested in the topic, but avoid it if you love naval history. The story of the USS Juneau is a lot like that of the USS Indianapolis. Survivors battled hunger, thirst, sharks and madness. Out of about 700 souls only 140-150 survived the explosion and sinking of the Juneau. After more than a week at sea only ten came away alive. The last survivor died in 2009.This story seems to be largely forgotten and I'm grateful that Dan Kurzman wrote a book on this tragedy. Yet I'm not entirely happy with his book. The story itself I give 4 stars but Kurzman's writing style is not entirely appealing to me. 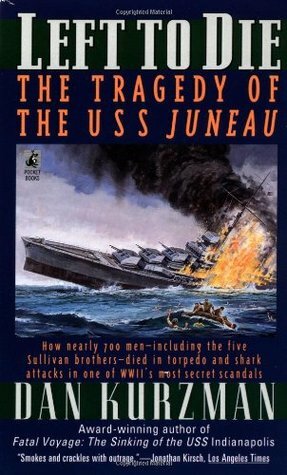 Though a story of incredible tragedy, I couldn't help myself from the very first page, I needed to know all that happened to the ill-fated USS Juneau and the lives of 700 brave sailors. Dan Kurzman, with this book, did a very fine job in honor of the memory of soldiers who fought valiantly in defense of their loved ones, their country and everything the stood for. A good read. USS Juneau better known as the ship on which the 5 Sullivan brothers died, but that's just one part of a huge tragedy. If you want the definition of "snafu," read this book. It's negligence to the nth degree, right up there with what happened to the USS Indianapolis (read Kurzman's book "Fatal Voyage" for more on that). What is it with the Navy and ships named in honor of US cities? I don't even remember how I came across this book, but I am glad I picked it up. It wasn't the most interesting read based on style and editing, but the fact that it is a true story and one of a few testaments to the transgressions of this tragedy grants it importance. I read this book because my Grandfather died on this boat. slow, but very interesting history of a major bad move on the navy...to leave 150 men for about 9 days, and come back to find only about 10 left alive. geez. what a tragic screwup.